The avionics suite available on the Premier IA is a large upgrade to the original Premier I. The Premier IA features 3 8×10” LCD which display all information necessary for the pilot. The standard Collins Pro Line 21 digital integrated avionics suite accommodates TCAS, EGPWS, digital weather radar and RVSM capabilities. The Collins Integrated Flight information System (IFIS) provides a range of display options including electronic Jeppesen charts, ,XM WX satellite weather and Universal weather map overlays. 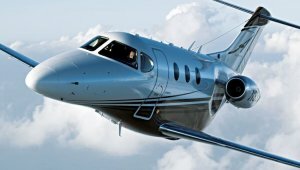 The Raytheon Premier IA is a small, twin turbofan-powered entry-level corporate jet configured as a cantilever low-wing monoplane with a T-tail. Wings and tail surfaces are swept. The retractable tricycle landing gear is of a relatively narrow track and employs straight oleo main struts. The fuselage is built in two main sections and is constructed entirely of carbon fiber and Nomex-honeycomb composite materials. The aluminum wing incorporates panels milled from solid aluminum stock. The somewhat unconventional shape of the fuselage reflects the extent to which computer modeling was used to determine a form which would best accommodate both the desired interior function and the high-speed airflow. The wing is mounted well below the fuselage pressure vessel with a curvaceous fairing to smooth the junction. The Premier IA cabin entry is via an air stair door located on the port side of the fuselage forward of the wing. Cabin dimensions are 13.5ft in length, 5.4ft in height, and 5.5ft in width. The Beechcraft Premier IA features a contoured cabin headliner that increases passenger headroom, adjustable LED downwash lighting and passenger reading lights. The interior is roomy, quiet and comfortable with features contoured seats that swivel and recline, a private aft lavatory, and the availability of a variety of audio and video entertainment systems. Cabin chairs have been restyled, adding side bolsters to the seat back and bottom cushions for increased comfort and new seat base contouring for more foot room for fifth and sixth seat occupants. Other improvements include a smooth single-action passenger work table incorporated into the lower sidewall, improved temperature control and table storage with 110 VAC outlets and provisioning for the optional Satcom flight phone. The cockpit has a volume of 85 cu ft while the remaining cabin area has 315 cu ft for a total interior volume of 400cu ft.